← T-14 Days and counting! Can you identify these cousins? After my 92-year-old grandmother died a few years ago, my mother was cleaning out her bureau drawers and came across a box of old photographs. Many of them dated from the turn of the century – and a lot were from the 1920’s. We could tell some of them were taken in California. I knew from my research that a great-great aunt had moved to San Diego, so we assumed some of the photos were probably of her and her family. But Grandma had neglected to note the identity of the folks in the photographs. And my mother didn’t know who they were. What a lost bit of family history! My own father-in-law, John Knapp, has a wonderful antique photo album of Knapp family photos. He can identify some of the people in the pictures, but not all of them. Finally, he asked one of his brothers to help put names to faces in the photographs. Hopefully, maybe he will bring the album along to the reunion and maybe someone can help figure out who is who so we can post these great photos. The point of all this is to remind you all to take a moment to identify the people in your photographs. Someday those photos will mean a lot to a family member. Remember, people often get bit by the genealogy bug only after they start having children or grandchildren. Wouldn’t it be wonderful to not only answer an inquisitive child’s questions, but also have a photo of Great Aunt Sally to go along with that funny story about her? So why not take a few moments this week to start noting who appears in YOUR family album. Your children, grandchildren, other descendants and your family historian will thank you for it. And just to get the ball rolling, I am asking for help in identifying all of the kids in the above photo. Click on the thumbnail image to see a larger version of the picture. I will give you a little help, though, by identifying two of the kids in the picture. 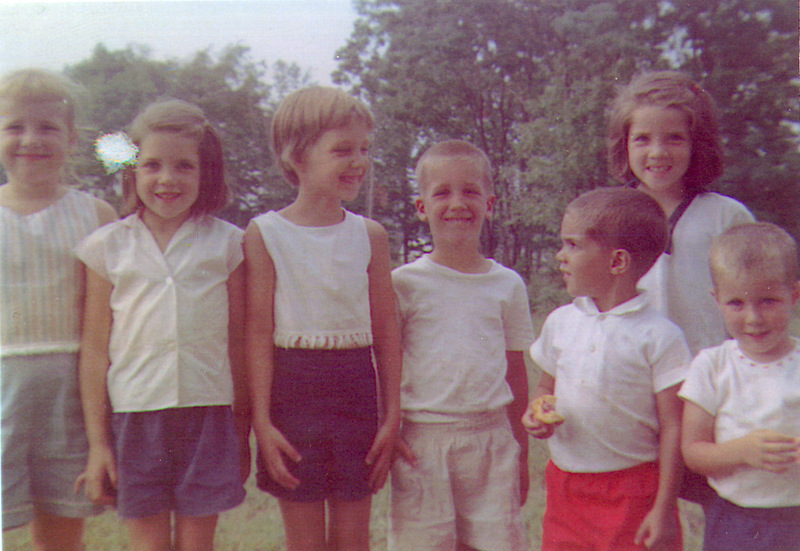 The fourth person from the left is my husband, Mark, and the other little boy is his cousin, Tom (called Tommy then) Knapp. One more clue: I believe the photo was taken in the 1960’s. Please write down who YOU think is in the photo in the place for comments below. Note: Comments to this blog are welcome, encouraged and greatly appreciated. Blogs are supposed to be two-way conversations, not monologues. Blogs are all about sharing information, so please feel free to share your thoughts and memories with us! 1. Click the Leave a comment link shown below at the end of each post. Click on the thumbnail image (little picture) below if you aren’t sure where it is located. 2. On the Leave a Reply screen, click inside of the Comment box. 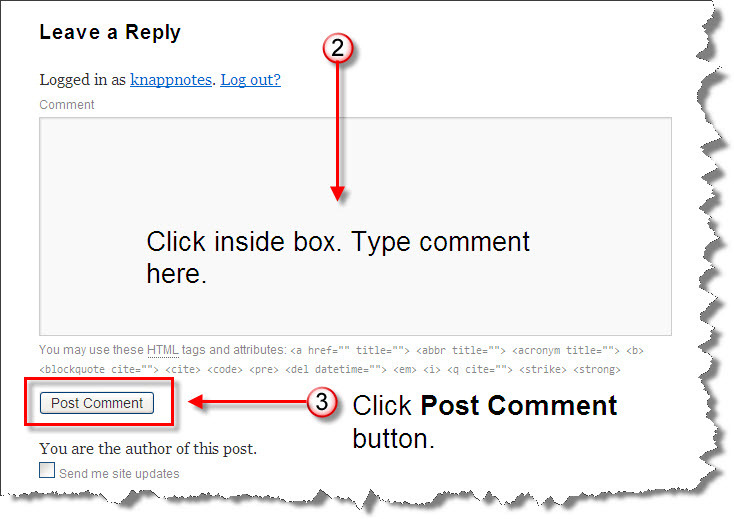 Type your comment into the box. 3. Click the Post Comment button. You’re done! Congratulations – You have just posted your first comment to a blog! This entry was posted in Family History, Photos and tagged Kline, Knapp, Mark Knapp, Tom Knapp. Bookmark the permalink. 1 Response to Can you identify these cousins?